Current lead time: 1 week. Last updated March 2019. Details and information on how to purchase this item is available here. 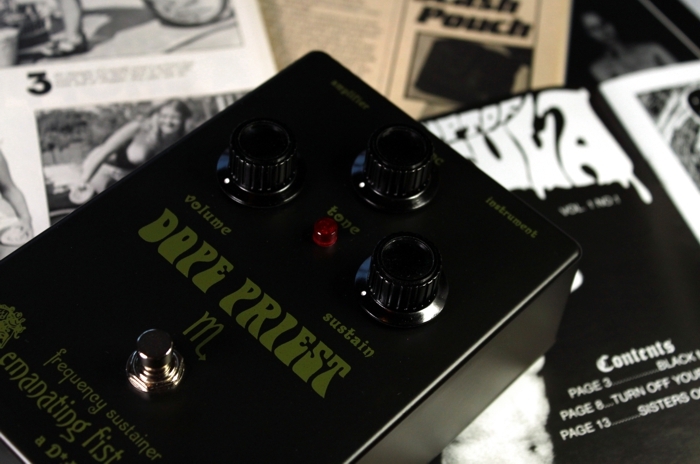 Emanating Fist Electronics presents, the Dope Priest - a frequency sustainer. A redesigned version of the much sort after 2005 D*A*M Ram Head. 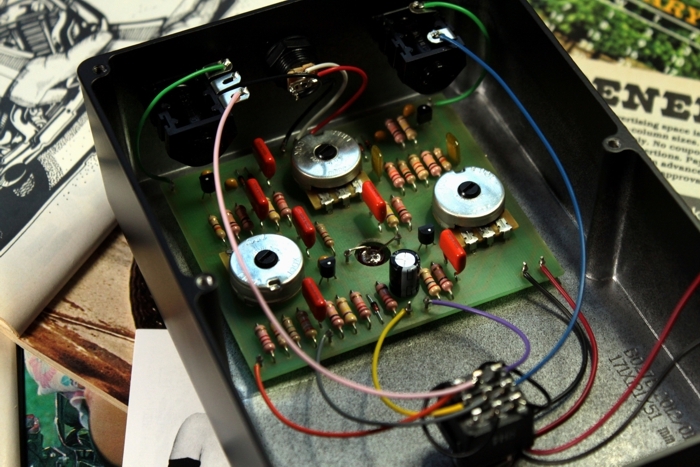 A condensed replica of the mid to late 70's Electro Harmonix Big Muff Pi and primarily based upon one of my own personal favourite fuzz units, a 1977 Guild Foxey Lady, a OEM version that was made by EH for Guild. Offering unrivalled midrange projection with total clarity the Dope Priest features highly articulate dynamics for such and intense distortion device. 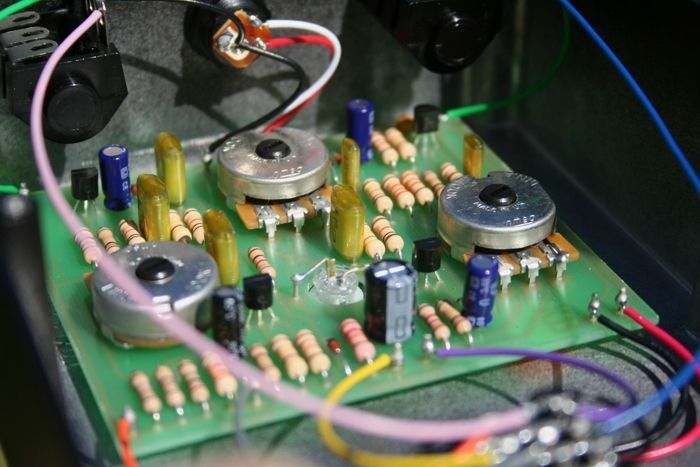 The four stage circuit is carefully tuned with a gain selected quartet of BC549C's, selected for their sonic similarities to the obsolete BC239C. These silicon devices act as the engine to your fuzz tone and guarantee highly satisfying user interaction and ease of use. The on-board controls further expand on the frequencies you wish to sustain and to distort. Offering a wide degree of flexibility from the mild to the extreme. Due to this controllability the Dope Priest is comfortably at home with vintage instruments and amplifiers and perfectly capable of successful interface with modern high output high volume sound equipment. Whether you seek the ancient tones of a late 70's Big Muff but without burden of the ever increasing vintage prices, or whether you seek a high gain distortion device tailored for the heavy but with its roots firmly embedded in the past, the Emanating Fist Electronics Dope Priest will give you the sonic enlightenment that you seek. The Dope Priest is also available with an alternative circuit configuration. Circuit type #7. Particularity tailored upon several choice Black Russian 7D Big Muff's but generally speaking #7 is a broad snap shot of certain choice features from the Sovtek era Big Muffs. Tonally this circuit variation has an extended low frequency response with a more refined gain structure. The lows are dark and stout with a very apparent midrange scoop. The high-end is healthy but not brittle or weak that still preserves an adequate backbone and musical artifacts even at higher treble settings. #7 makes use of a logarithmic taper on the level control. This is an important feature for the Russian circuit as it adds a great deal of control over tuning tonal shapes and adds smoothness to the distortion at lower volume settings. #7 is an ideal fuzz tone for bass instruments and players requiring extended response in the lower registers. #7 features four gain selected BC547B silicon transistors and sports a high brightness red LED. Each EFE Dope Priest is meticulously hand assembled by Daniel Lee Tunstill with all transistor selections, set-up and final testing carried out by David A Main.